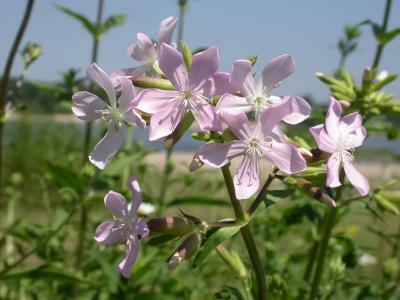 Soapwort (Saponaria Officinalis) - This is a stout native plant about 2 to 4 feet high, with large fragrant blossoms, usually rose-pink, the double variety being best. It is an especially pretty plant for rough places in the hedgerows and wild garden. Soapwort is hardy, growing in any soil, but needs good drainage. It does not mind sandy conditions; it is appropriate for cliffsides or mountainous regions, as well. This perenial is most appropriate for U.S. hardiness zones 3-9. Plant in mid to late spring, suggested spacing is five to six inches apart. Saponaria Caespitosa - A neat little alpine perennial, good in the higher regions of the C. and E. Pyrenees, flowering in August, but in the lowlands its beautiful rose-colored blossoms appear towards the end of June. It forms rosettes of linear leaves, thick, glabrous; the flowers, forming a thick cluster, are supported by short stout stems. This graceful little plant is valuable for the rock garden. A sandy soil suits it best, and it endures fairly cold winters. Saponaria Calabrica - A prostrate hardy annual, 6 to 9 inches high, its slender stems covered with small pink blossoms all the summer. Seeds may be sown in the open border in April, or earlier in heat if bloom is required early in the season, in rich sandy loam. Saponaria Lutea - A little rock plant, 3 to 6 inches high, with narrow leaves like those of the Alpine Catchfly and a neat tufted habit. The pale yellow flowers come as close woolly heads in early summer. Italy. Saponaria Ocymoides - A trailing rock plant, with prostrate stems, its rosy flowers completely covering its leaves and branches in early summer. It is most valuable for clothing arid parts of the rock garden, where a trailing plant is desired, as the shoots fall over the face of the rocks and become masses of rosy bloom. It is also excellent for old walls, and the seed should be sown in mossy chinks where a little soil has gathered. It thrives in ordinary soil, and is often a good dwarf border plant. Two or three garden varieties are now grown, the best being splendens, with much brighter flowers, alba, with pale flowers, best in partial shade. Seeds and cuttings. S. and C. Europe. Soapwort makes a very nice addition to any location that has good drainage. If you live in a compatible zone, use it to add beauty and contrast to a rock garden or another spot that could use some brightening up.